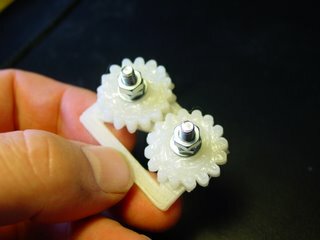 I've printed out a couple of polycaprolactone gears and an impromptu plate to hold them in place. We're laying down about 4cc of polymer/hr using the 2.5mm filament that Forrest sent me. I've upgraded my Mk2 extruder to Adrian's revision with the 2.5mm holder. Probably needs more calibrating but goes for now. Here is a 2M MPEG video of the gears meshing taken using my decent Sony cam and a tripod. The "Darwin" design doesn't use gears per se., but as they're bound to be desired in some mechanisms I thought I'd print them out as a learning exercise. The teeth do distort as they get higher, something that thinner layers or an improved deposition algorithm may solve. Oh my! Those are SO beautiful! Did you use the cog or involute script to make them? They're done with the latest involute script. this is very exciting. i just got my first shipment of stuff i need to construct my own reprap. if i needed any more encouragement to start, this is definitely it!